Coconut oil is a wonder balm for a variety of skin aliments. It an all round magic skin balm. Coconut oil has a variety of health benefits when used in cooking such as regulating blood sugar, fighting heart disease and improve the immune system. But used topically it can help a variety of skin, hair and body issues. In fact I’d place a bet that you could replace all pretty much all of your beauty regime with Coconut Oil if you wanted to! Lip Treatment - Perfect for chapped lips Skin Softner - Smoothed into the elbows or knee’s to soften dry skin. Makeup Remover - Ideal for removing makeup without the use of chemicals. Shaving Balm - Close shave and a moisturiser at the same time. Deep Conditioner - Left in the hair overnight to leave the hair looking shiny and smooth. Hair Oil - Applied to the ends of the hair to smooth and tame frizz. Body Scrub - Combine coconut oil and sugar. Massage Oil - Great choice for a massage oil as it’s not too greasy and smells lovely. After Sun- Highly moisturising so great for sun exposure. Homemade Toothpaste - Combine equal coconut oil and baking soda & sweeten with stevia. Oil Pulling - Swished around the mouth like mouthwash to reduce bacteria. Hair Mask - Use overnight on the hair for a super nourishing natural hair mask. Seriously there are so many ways you can use the stuff. For me I like it best when used as a hair mask. Left overnight it leaves my hair looking shiney, managable and easy to tame. I'm converted to the Coconut Oil side. 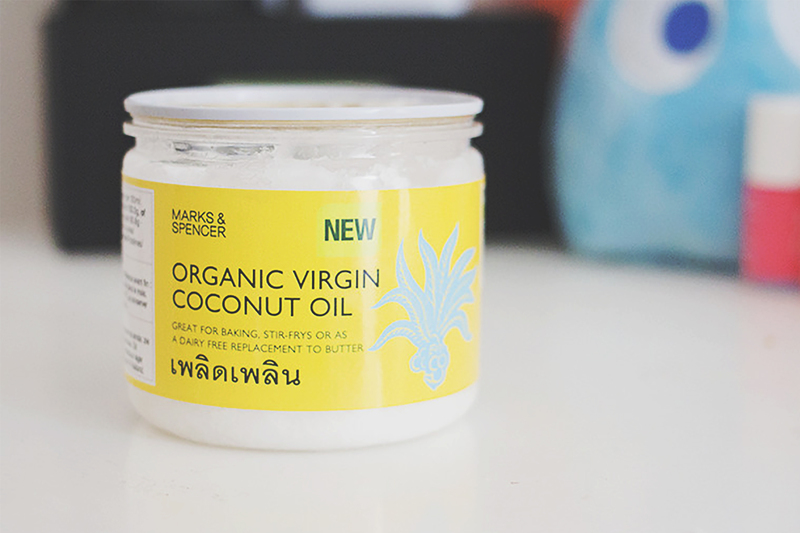 I buy my Coconut Oil from M&S but you can pick it up in most supermarkets in the health food sections. It also tastes awesome on food, I like to use it when roasting sweet potato for a subtle coconutty taste. Yum! aah i've heard the most amazing things about coconut oil and how versatile it is! definitely need to go and grab some! I love coconut oil! I always use it as a hair mask and my hair feels sooo soft and healthy after using it! It's official, I really need to start incorporating this into my routines! I don't love the smell of coconut but the benefits sound great! I always use coconut for roasting veg or as butter, but the multi-purpose use of it is fabulous! Ahhh where would I be without my beloved coconut oil?? I love applying it after cleansing in the evenings. I find it has the same effect as Kiehl's Midnight Recovery Concentrate except for a fraction of the price! I've heard so many great things about coconut oil I really need to try it! I have never tried it but def I should! I love coconut oil too, it's great, I use it for so much things! i ALWAYS use it as a shaving balm- so smooth! Not a day goes by where I don't use coconut oil in some way. I uses it on my lips, face and hair and I cook with it! It is literally the best most versatile thing ever. I get mine in a massive jar from Holland & Barret, love it! I love using coconut oil, I sometimes use it when I'm frying vegetables, and it's excellent to use as a moisturiser (and smells amazing). Coconut oil is a miracle worker and it smells amazing ! Love coconut oil! It works so well! I use my fractionated coconut oil as a makeup remover and it works like a charm! Vou pensar seriamente em experimentar! Ahh coconut oil is amazing!!! Its so good for the hair, its even SCIENTIFICALLY proven - and i get excited about that part as I am a scientist - haha. This is real interesting. I've heard it can be used for so many different things too, but I haven't had a chance to give it a go. I might try it out soon! I love the idea of using this as a shaving balm!